Create your own natural toothpaste with natural ingredients, which do not contain any harmful chemicals. 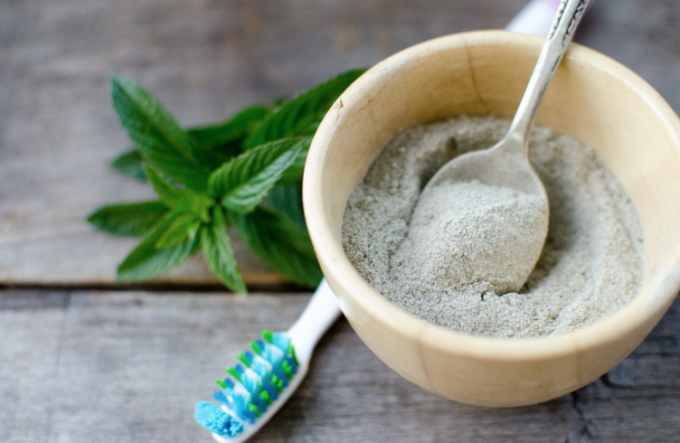 Here are some recipes for natural toothpaste. Preparation:Mix ? teaspoon turmeric powder with a little coconut oil. You need: 4 tablespoons bentonite clay, ? teaspoon activated charcoal, ? teaspoon clove powder and 1 teaspoon soda. Preparation: Mix all the ingredients with a plastic spoon in a glass jar. You need: 4 tablespoons of coconut oil, 3 tablespoons of bentonite clay, 2-3 tablespoons of filtered water. Preparation: Mix coconut oil and clay in a small bowl. Add some water to adjust the consistency. You need: ? cup soda, 10 drops essential oil peppermint and 3 tablespoons cinnamon powder. Preparation: Stir thoroughly soda and cinnamon in a bowl. Add the essential oil and mix again. Use as a tooth powder and store in a sealed jar. You need: 2 tablespoons bentonite clay, 1 tablespoon sea salt, 1 teaspoon crushed dried sage leaves and a small amount of water to give consistency. Preparation:Thoroughly mix all ingredients except water. To clean the teeth, first take ? tablespoon of the resulting powder and add a little water, forming a paste. Keep in a container.